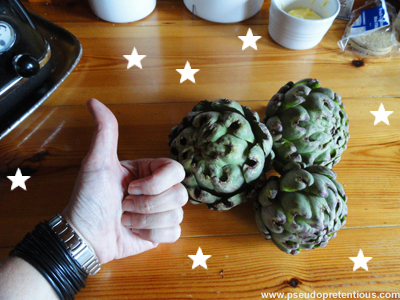 a couple of weeks ago, my neighbours went on holiday and asked me to please take one of the globe artichokes because it was ready to be eaten. i LOVE artichokes so i snagged it just as soon as they left and steamed it and ate it – it was THE BEST FRICKIN’ ARTICHOKE I’VE EVER HAD IN MY LIFE. i’m not kidding. it was that good. on a side note, i usually eat artichokes with a little butter and lemon, but i had read somewhere about mayo and balsamic vinegar so i tried it. it wasn’t pretty, but it was EXTREMELY tasty. fast forward a few days and the neighbours returned home. i immediately raved to them about how awesome the artichoke was and that it was perfect and i slabbered on about it for a while… blah blah blah and they’re gonna give me some cuttings from their artichoke plant (excellent!) blah blah blah. fast forward to yesterday. the doorbell rings, i answer it, it’s the wee curly-haired boy from next door… with these… for me! This entry was posted in groovy and tagged food. Bookmark the permalink.